My timing is always bad. Between film festivals, five children, and a real life I often don't get to as many books when they first come out as I would like. 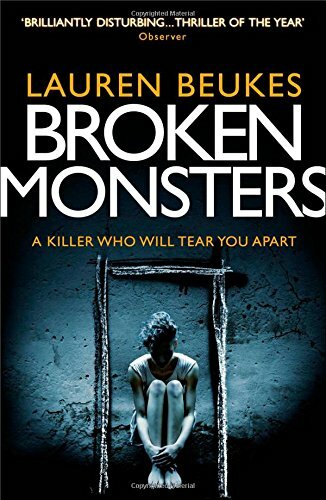 I missed The Shining Girls on first release but I have a copy of Broken Monsters now so I can I finally get to grips with Lauren Beukes. What a stunning writer! From the opening monologue I was hooked like I was when I first started reading Stephen King novels. Set in the murderous wasteland of Detroit, Broken Monsters follows multiple characters as they all get sucked into the horrific events started by Clayton Boom. Boom has killed a deer, driving into it and watching it die whilst his head is opening up to another realm, a dreamlike world beneath our own, and tries to bring these dreams in to the real world with a sick human/animal taxidermy experiment. Detective Gabi Versado, whose story opens the book, is a smart policewoman and mother of teenage daughter Layla. Versado thinks she has seen everything that Detroit has to offer until the body of a young boy attached to a deer is discovered, setting Versado onto a path of sick human destruction that no one should have to follow.TK is a homeless man, tortured by his own violent past, who spends his days searching the abandoned houses in Detroit. After a chance meeting at a soup kitchen with Clayton Boom TK is also dragged into a world of nightmares. Jonno is a struggling journalist and writer who meets and sleeps with a young DJ, Jen-Q. Jonno hopes that Jen can spark him back into life, showing him a side of Detroit not yet investigated, that could lead to the article that would put him back on top. Unfortunately for Jonno he too has crossed paths with Clayton Boom. The social commentary produced with the plots and sub plots by Beukes is astonishing. The reliance of individuals on technology in order to hide away from the world is covered well. 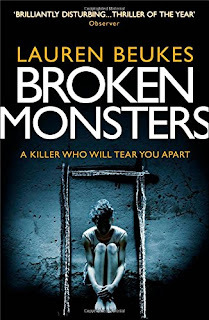 The more supernatural elements of Broken Monsters are superbly imagined and a distinct, bullet-fast narrative, leaves every muscle in your body tense, your brain shattered, and your mind broken. The pace the book runs at is relentless, almost film-like in visual descriptions, and Beukes has captured the human torture, both physical and mentally self induced, like not many can. It reads like a film plays, teases your imagination with visions of a dark life both realistic and nightmarish in gritty detail.